HOME DZINE Home Improvement | Flip not flop! Property prices continue to climb and it is becoming increasingly difficult for the first-time buyer to afford that dream home. 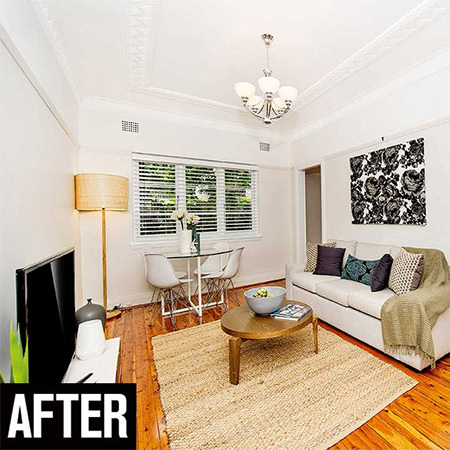 More and more first-time property buyers are realising the potential to buy an older home, or property in need of attention, and flip this for a fast profit. By doing this, first-time buyers are able to save up the money they need to aim higher on the property ladder. Buying an older home and fixing it up is definitely one way to start your climb on the property ladder. But you have to be prepared to put in a lot of your personal time and effort to flip the property. You should also be prepared to stay in the property for a reasonable amount of time to turn a decent profit for all your hard labours. But that's an advantage, since it gives you more time to add cosmetic details that make a house more appealing to buyers. ABOVE and BELOW: The original living room was dated and dull. After stripping and staining the hardwood floor and painting ceiling, walls and trim, the room looks fresher and in line with what a buyer is looking for. 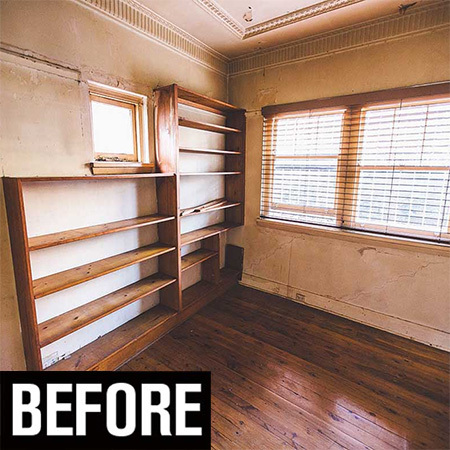 The secret to a successful flip is to know property prices in the area and what the average selling price is for a property of similar size. With that knowledge in mind you will have an idea of how much you can spend on renovating and an estimated profit on your return. 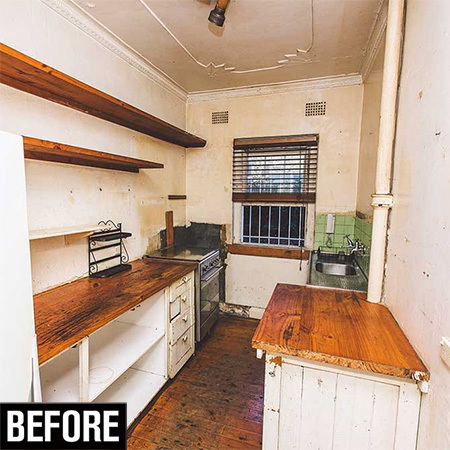 The best way to flip a property is to keep it simple. 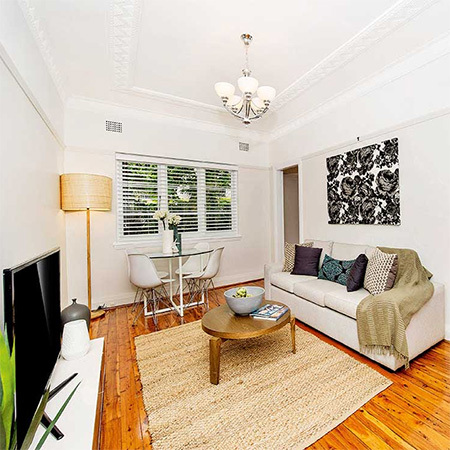 The goal is to have a good return on your investment, and for this reason you want to avoid adding to much frilly detail and keep to the basics. 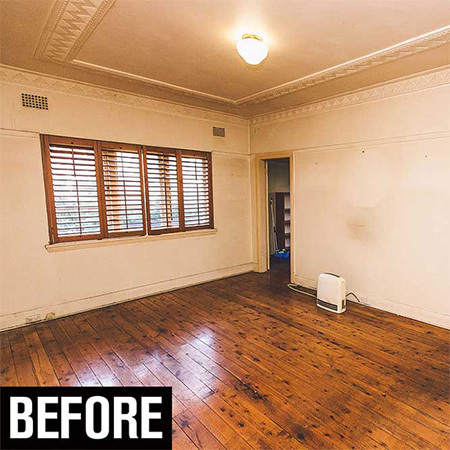 When you decide it's time to sell you want to be able to present a clean, blank canvas that will allow potential buyers to see themselves living in the property. Kitchens and bathrooms are a major selling point for any property, and while an older home may require some attention to old fittings and fixtures, you can save money simply by keeping the layout the same to avoid moving water pipes or electrical wiring, and splurge on new fittings and appliances that appeal to buyers. ABOVE and BELOW: The galley kitchen definitely needed an upgrade. 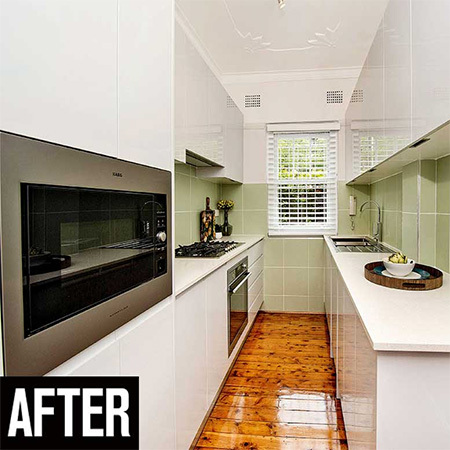 With the addition of new floor and wall cabinets, the installation of new tiles, and some renovation on the hardwood floor, the kitchen is fresh, clean and modern. To maximise on the limited space available, appliances were hidden behind cabinet doors to give the kitchen a seamless look. To keep details as simple as possible, stick to neutral colours throughout. Where a property has hardwood or parquet floors, have a professional restore these and opt for a gloss finish to add wow factor. If the property doesn't have wood flooring, you will need to replace the flooring with neutral, modern tiles or laminate flooring. 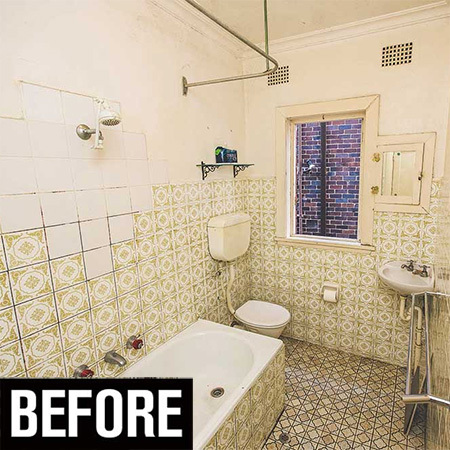 ABOVE and BELOW: The bathroom was of decent size, but the busy, dated tiles made the space feel cramped. Floor-to-ceiling tiles with a glossy finish make the bathroom a more spacious, even with the addition of a storage vanity. 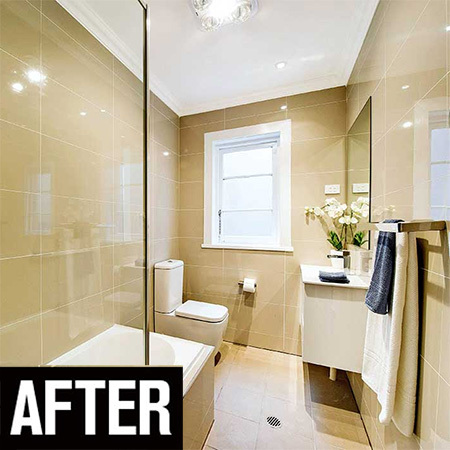 The glossy tiles also help to bounce light around the room and make up for the small window. While it may cost a bit to overhaul the kitchen and bathrooms, you can save money in other areas simply by focusing on the essentials. Older homes tend to have period details that can be a selling point and only require cleaning and painting to turn them into high-impact details. 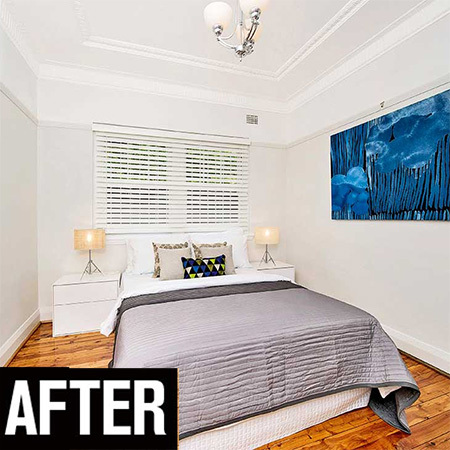 ABOVE and BELOW: Dark and dingy, the bedroom was gutted and painted to refresh and update. The addition of white Venetian blinds provides a seamless finish that allows a unbroken flow to the room. The hardwood floor was stripped and finished in a high-gloss varnish.